Airport in Egypt's Red Sea resort of Sharm el-Sheikh. The decision to resume flights to Cairo may be taken soon, Russia's Deputy Prime Minister Arkady Dvorkovich told reporters on Saturday. "I am not telling the time, but I think the decision on Cairo is close," he said, though refraining from giving time for flights to Hurghada and Sharm el Sheikh. The official said as yet he did not plan meeting with Egypt's representative on that topic. 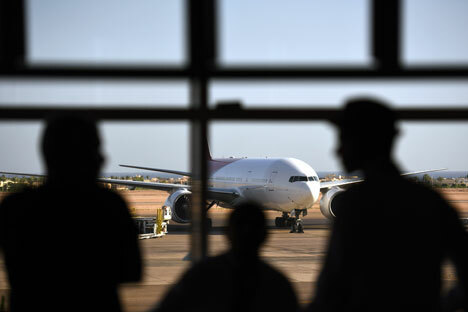 "As yet, a meeting is not planned (with head of Egypt's civil aviation authority)," he said, "but anyway, like we said earlier, a priority is to open flights to the Cairo airport, and then we shall continue working on the rest." On Jan. 27, Russian Transport Minister Maxim Sokolov told reporters a delegation of Russian aviation specialists may visit Cairo in February to carry out the final check of the airport’s security. "Most likely, in February. I hope this visit will be the last," he said. A week earlier, a group of Russian experts returned to Moscow after inspections of airports of Hurghada and Sharm el-Sheikh. Now the Transport Ministry is preparing a report for the government on the security of Cairo airport. It is expected that a gradual resumption of flight connection between the countries, will start from that airport. The flight connection between Russia and Egypt was interrupted more than a year ago after the crash of the Russian aircraft on the Sinai.